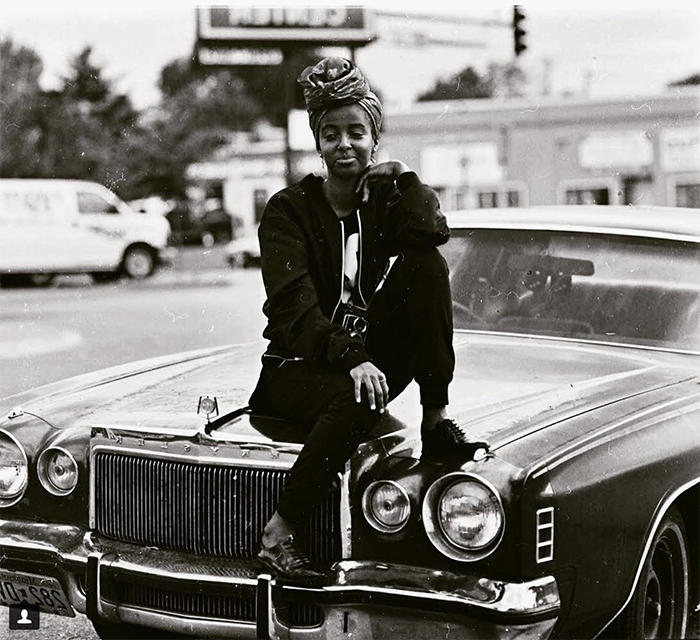 Local photographer Den-Zell Gilliard reflects on the importance of community storytelling through two very personal projects. Not afraid to center himself at the heart of where a story lies, Minneapolis-based photographer Den-Zell Gilliard’s work merges journalistic documentation with street photography elements to create images that capture the unearthed truths and reveal their cultural relevancy. In recent years, Gilliard contributed on a local project documenting the intimate, real-life stories of victims of police brutality, abuse, and misuse of power. The project was dubbed Behind the Blue Line and featured a devoted team of writers and photographers, including Gilliard, Annabelle Marcovici, Joe Davis, and Erica Seltzer-Schultz. The subjects were photographed at the scene of their victimization — usually a home or a crime scene — and interviewed about their experiences. 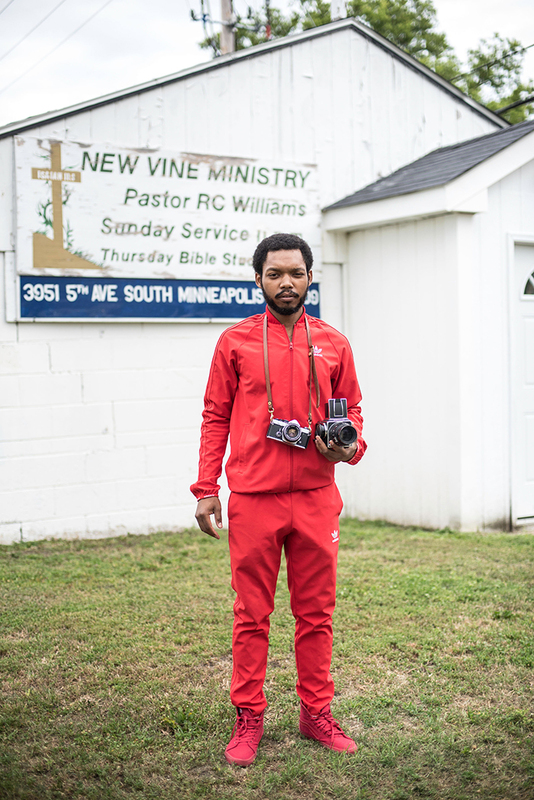 For his latest project, Gilliard has teamed up with the Pillsbury House’s Art Blocks Program to produce Sunday’s Best, a photo series highlighting some of the Twin Cities’ oldest Baptist Churches. As part of the Art Blocks Program, artists get the opportunity to use their artistic practice to deepen relationships on the blocks where they live. A vibrant and poignant project, personal in nature, Gilliard takes an in-depth look into a culture whose aging members mean their rich history is slowly disappearing. The series features members of El Bethel, Saint Peter’s AME, and Greater Saint Paul Churches and congregations that have been neighborhood staples for over 135 years. Whether documenting neighborhood architectural fissures or adding political commentary to a portraiture series, it’s clear Gilliard believes in the preservation of culture and seeks to examine both its aesthetic and emotional significance in his work. 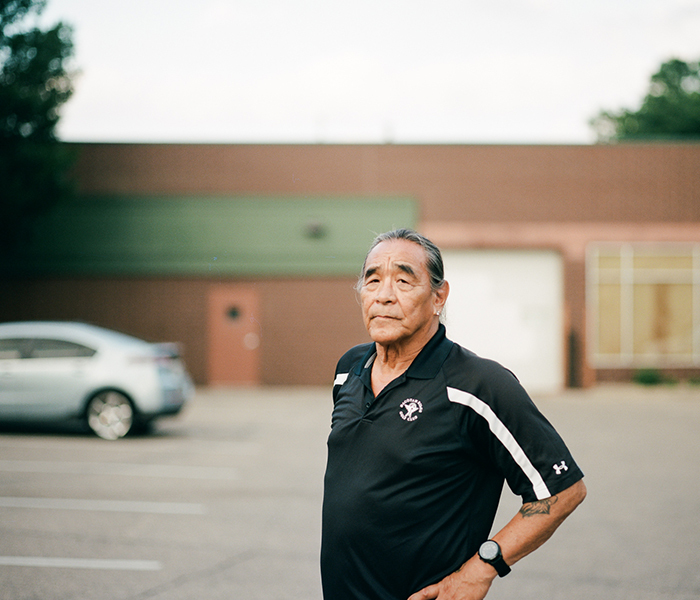 We caught up with the local photographer to chat about projects, past and present, and how his street approach to documentation carries a more personal touch. Juleana Enright: Originally you majored in law enforcement, but then made the career jump to pursue photography. What made you feel you could give back more to the community through this pursuit? Den-Zell Gilliard: For me, it was about the outreach. I knew I could reach a bigger audience through photography. I’ve been able to relate and get to know people that I would not have through a role in law enforcement. Ultimately though, I made the decision because I wanted to give back in a more positive way. I don’t think law enforcement can do that; art can. JE: Tell us about your involvement with the Behind the Blue Line photography project. How did you team up with your fellow creative collaborators, and what motivated your desire to help tell these particular stories of police brutality? DZG: The original writers of the project messaged me because they saw my work on Instagram and needed a second photographer. It was a really hands-on experience. I would go with our team of writers and interview/photograph the victim on the spot of the crime. Documenting everything is the key. Being personal with your subject really helps to get those sought shots to tell the best story you can. JE: Do you still have friends in the world of law enforcement, and if so, how do they respond to the Behind the Blue Lines project? DZG: I do. I never asked them about the project. That's something I would feel more comfortable doing now. It was a pretty heavy project. Definitely no police involved. JE: How has your work within Behind the Blue Line shaped your current photography and focus? DZG: Since working on BBL, I’ve pursued projects with a similar approach, going in-depth with the subject and documenting them outside of studios, in the streets, or on the site of the story. Sunday’s Best is my newest project, which was funded by the Pillsbury House. 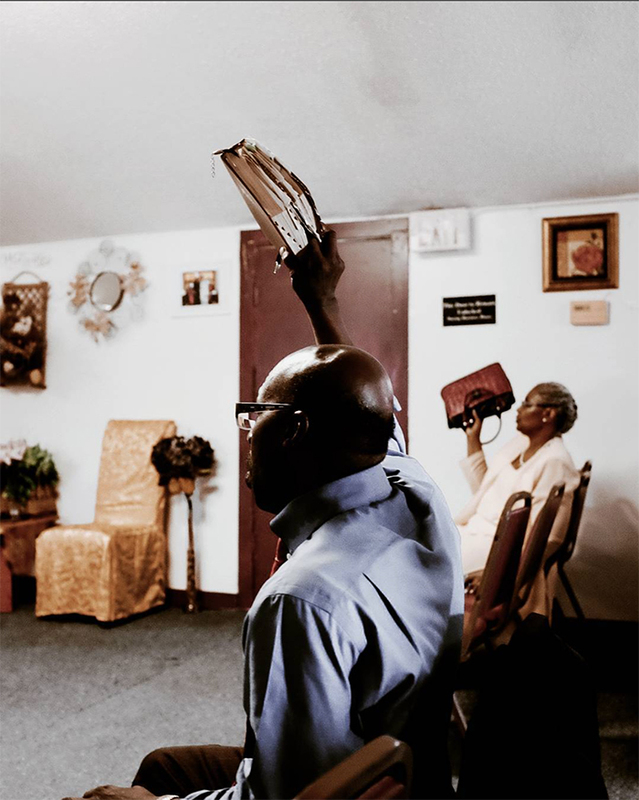 It was a three-month-long docu-series where I shot some of the Twin Cities’ oldest Baptist Churches and their members. The final reveal will be in exhibit form, but the project will continue once a year. For the next chapter, I might expand on my series The Odyssey of the Black Boy using community from the 8th Ward. JE: What drew you to working on the Sunday's Best project? Do you have a relationship with church communities? 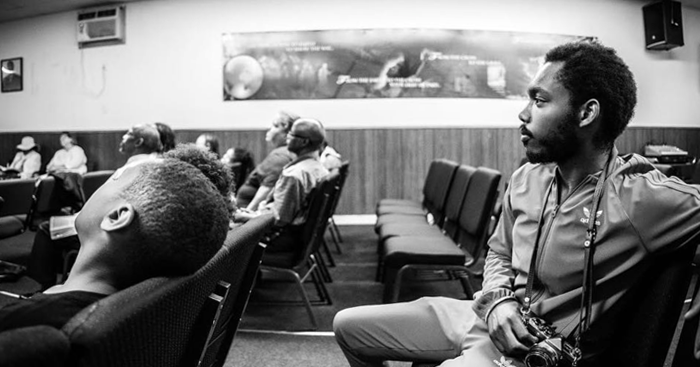 DZG: I grew up in the Baptist church, and I always wanted to document that community. The elders won't be here with us forever. It was insightful to have that opportunity to learn from them. JE: What do you think it means to be a political artist in our current political climate and what responsibility does that hold? DZG: It’s really important that I can help make an impact from my work. As an artist, you have the opportunity to have a huge platform to say whatever you want and use that to start a movement. I think it’s a powerful time to be an artist. JE: Both the BBL and Sunday’s Best series are connected to specific locations, and the storytelling element is very site-specific. Where do you see the line drawn between art and photojournalism? DZG: To really make an impact you have to go in with an artist's mind but really tell the story. I never went to school for journalism or writing, but I love telling stories. At the end of the day, it's all about getting to the personal. The photographer at work. Photo by Bruce Silcox. 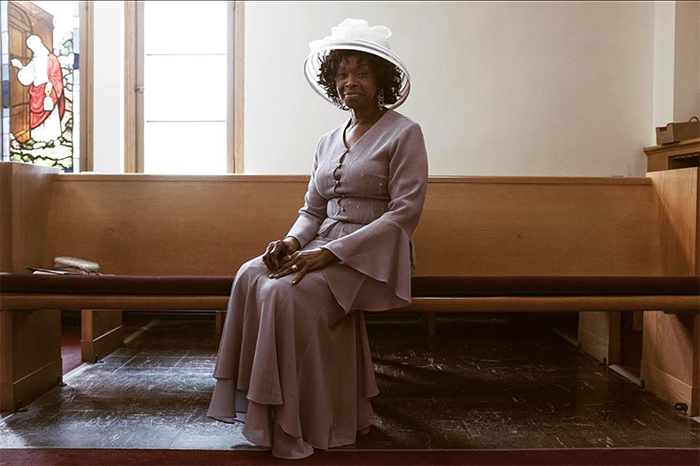 Den-Zell Gilliard will be giving an artist talk about Sunday's Best, including a slide show of the photographs, at Third Place Gallery on Wednesday, December 27th, 7 - 8:30 pm. To see more of Gilliard’s work, follow him on Instagram @denzellg. Banner image photo by Bruce Silcox.